"I am in the process now of sending a large contingent of forces towards 2, who will then proceed towards 3. All of my heaviest weapons and most zealous warriors will cleanse the xenos filth from the world." Cassiel considered for a moment longer. The port was secure, the easternmost point of engagement. The cliffs were secure. Two additional beachheads lay between the two Draco teams. Moving west would take them directly into the fight, striking the xenos from a flank as they were engaged with the guard attacking from the polluted lake. "Ambrose, you're a genius. Those of us who lack your stature will surf the steel wave. Mount up Draco, we're heading into combat and connecting with the other team. Ambrose, follow with all possible haste and engage the enemy where you find him. We'll be heading back this way in short order, so don't worry if you fall behind." "Gloria in Imperatorem. May your wrath bring them to their knees. Vorenus out." Lucius took a moment, grateful that Draco's competition, as it were, were committed to engaging the xenos across the open terrain. With the forces near him moving to support the next battle from their high ground, he found a covered area near some rubble and took out the brain fragments from the synapse creatures. "For the Novamarine and Carcharadon Astra, Primarchs and Imperator protect the traditions of hold." He then placed the flesh up to his tattooed face and dropped it in his mouth. The strategic ritual began anew. "I WILL MAKE THE HASTE OF THE KHAN AND MARCH IMMEDIATELY!" Ambrose started plodding his way as fast as he could towards the next landing zone. No questions, brother." Bleda gets ready to move out. Lucius is filled with more synaptic information than his mind can hold. Wave after wave of thoughts, orders, and counter orders fill his mind to capacity. He is overcome by a wave of nausea, and not from the foul taste of alien flesh, but from the searing migraine that surged through his mind. He also felt light headed. They were certainly in a stronghold of the enemy. The hive mind was strong here, not in the immediate vicinity, but in the small city itself there must've been hundreds, if not thousands of hive node creatures. As a whole, he understands that the tyranids had been caught unaware, but not unprepared. It seems like they were preparing their own invasion of the hive as well. Across the vast stretch of coastline, they were launching counteroffensives at the landing zones. These were strongest in the area's without astartes presence, it didnt feel like a purposeful avoidance. Maybe without the hive mind creatures that were already there they considered the sites lost and concentrated on other avenues of attack? "We need to start looking for Ironbound. I know helping the guardsmen is your concern, but its not our priority here. Makradon states he's out to the east of this city. Already the ministorum are sending forces out to look for him. You can bet if they find him first they will not share him with the ordos xenos without orders from his superiors." He looked at his half of the squad, they were the hardest hitting, but they were the slowest with Makradon and Ambrose. Ambrose was edging towards the squads and vehicles heading west. "Ambrose, thats the wrong way." he warns. "There may be '=greenskins that way, but the ones runing the show are out this way." he points east, towards what looked like a rocky desert. They knew from the maps Donovan had provided that there were dozens of small villages and promethium camps scattered in any direction, Ironbound had to be in one of them. "I SHALL FOLLOW YOUR DIRECTION, BROTHERS. WHERE ARE WE GOING IF NOT TO ASSIST THESE GUARDMEN?" Lucius repeated in Draco cant. "Brother Cassiel, I read you. I thank you for repeating our mission parameters. I had nearly forgotten. We are an hour out from your current position at our fastest. Do you intend on waiting for us or would you have us be perpetually an hour behind?" As he waited for a response he voxed back to Khol, Seraphan, and Albrecht. "You heard Cassiel and you know how far out we are. I want your opinions on moving back and abandoning the line here." "Our mission parameters are clear. What if Cassiel and his team are delayed? We should commandeer a Chimera and a driver and head east with all haste." Albrecht folded his arms, his mind clearly made up. Lucius expected Albrecht's response. "We would be breaking our oath to the guard, whereas a delay does nothing negative to our honor. Regardless, if Cassiel's team is delayed, our leaving now would do nothing to change that." He didn't fully reject Albrecht's plans, but he did wait for the others to chime in. Khol hears Albrecht's statement while leading squad Otho back to friendlies. He looks at them, whats left of the dead, & then further out into the battlefield with current fighting. Khol turns away from Otho & tries to speak as quitely he can, "And what about our promise with our fellow man?". THIS IS NOT THE TIME FOR DISCUSSION, IT IS THE TIME FOR ACTION! THE ASTRA MILITARUM REQUIRES OUR ABILITIES TO DEFEAT THE GREENSKIN. LET US CHARGE FORTH ALONGSIDE THEM, AND ROUT THIS FOUL ENEMY! AS THE MINISTORUM HEADS EAST, STRAIGHT INTO DANGEROUS TERRITORY, WE SHALL FOLLOW THEM! Ambrose then turns and starts heading east. Albrechts gives Khol a flat stare, slight indignation in the Templars eyes. "You think I have forgotten the oaths I have made?" it was a rhetorical question, Khol surely knew that Albrecht would forget no oaths. "No brother I do not forget such things. We promised on our honour that we would aid the guard and we have done so. Lets us not forget the oaths we took with the watch-captain when we took the mission to find Ironbound. It is clear to me which has precedence. We should head east and assist where we may enroute, if the others fail or are delayed we should be there and not many kilometres from our primary objective." Albrecht. But everyone will be heard. Seraphan?" Serephan was quiet for a moment. Considering what he had just done, he didnt think speaking about retaining their oath meant very much anymore. "The warmaster sounded like Ironbound was the key to victory here. Perhaps he should be the absolute priority?" Lucius's suggestion that Cassiel cares deeply for the guard starts Cassiel laughing. It would be a hideous sound that shakes his whole body like an epileptic seizure. It is ending when he finally engages the vox with a chuckle. "Ironbound is everything, but for the moment your orders are to assist with the landing zones. Lucius, commit your team to aiding Landing zone 5. Use your best judgement regarding using your elevated position to rein down fire and brimstone or if your swords will do more. Speed is of the essence. When the site is secure, head toward our position. We'll be fighting along the beaches. Don't worry. I vow that we will find Ironbound before the Cardinal." Cassiel continues his disturbing laugh for another moment while trying to join the armor column moving toward the second landing zone. Rising was faster than walking, and this phase of the mission required as much speed as possible. Lucius raised an eyebrow at the manic laughter coming over the vox. He was surprised Cassiel hadn't ordered them back immediately. "Roger that." Lucius looked toward his team. "It looks like our little display of democracy has been over ridden. Albrecht and Seraphan, cover the flanks. Khol, take point with lead elements of the guard. Let's get this done." Albrecht shakes his head "This is madness"
With the Cardinals forces now on the move Albrecht couldn't make sense of Cassiels decision, at least part of the team should be making attempts to secure Ironbound now and not get bogged down in a war of attrition with the Tyranids. "Brother Cassiel, this does not make sense. We're allowing the cardinal a chance at locating Ironbound before us. Why are we taking this course?" The orders to engage the Tyranids before finding the Ironbound puzzled Bleda, who was ready to move out in search of said Ironbound. Either Cassiel was unfocused on their objectives or he knew something that the others didn't or took factors into account that the rest of the Kill Team didn't know about. Either way, it was not reassuring. "The Ironbound is our main priority, Brother Cassiel. It would be ill if we had to liberate our objective from the Ecclesiarchy by force of arms, which this could come to if we get bogged down while they search." Bleda sends ove the vox. Tired of his brother's indecision and bickering, he continued eastwards, following the ministorum troops heading away from the landing zones. He sings loudly through his vox-caster ancient, and frankly terrible songs about killing orks, in a vain attempt at inspiring the troops around him. There seemed to be a dispute as to what their next course of action was. Though Hydrako was inclined to agree that the asset should be secured before the Ecclesiarchy, the fronts that they had not secured were in danger of falling. Trying to find the Ironbound in a swarming horde of Tyranids would be much harder were the attack to falter. After collecting his fallen storm bolter, he strode towards a chimera that was rolling towards landing zone 2 and squeezed into the troop compartment. We should make haste to close the noose around the xenos' neck. Cassiel sighs. "Albrecht, your opinion has been noted. This is not the time for a lengthy discussion. You are permitted to disengage and begin an individual pursuit of Ironbound if you are do inclined. If you prefer to remain engaged with the enemy between us, we can discuss it face to face shortly." Albrecht's decision to question his orders from across the battlefield rankled. Cassiel didn't mind others offering opinions, but Albecht was showing himself a fool. Bleda at least could see the Cardinal's forces and fully grasp the tactical situation. "Brother Bleda, our mission is not just finding Ironbound. Accepting me as your leader means deferring to my judgement. My dedication has not wavered. Searching for Ironbound at all costs at this moment would certainly make finding him more likely, but it will do nothing to help us deliver him. When you are given orders, it is your duty to follow them. When you are given command it is instead your duty to interpret the mission and issue those orders. After the mission everyone will have the opportunity to question my choices. Save it until then." "Hydrako, thank you. Your example is a credit to your chapter." Lucius cast a glance at Albrecht. With Seraphan's ability to cohere questionable, losing Albrecht now would be a huge loss to his team. But it also would prove to be an exceptionally telling decision. He would not order him to stay if he chose to leave. Now was the time when Draco would see where Albrecht's priorities truly lie. Albrecht looked to the heavens, spore rained down and in the distance gargoyles wheeled amongst the dark clouds which were turbulent with the disturbances caused by the corruption of the Tyranid invasion. The fight for this world would not be over quickly. Albrecht was no fool, it was clear what their priorities should be, this madness risked conflict with the Cardinal and an enhanced possibility of not acquiring Ironbound. He had no chance on finding Ironbound on his own as the Dark Angel no doubt realised. He’d also made oaths to follow Cassiel and he would not break them, at least unless he was given real reason. Although he certainly wished he hadn’t made them. “You give me no choice Cassiel” the contempt on Albrechts voice was evident. He cuts his squad vox and turns to Lucius and the others “Come then, let us get this done as quickly as possible.” he says curtly. Albrecht takes his helm from his belt and fixes it in place on his gorget. His axe is clasped tightly, he had an urge to kill something. Makradon listened quietly and contemplatively to the conversations that were happening around him. Loyalties and oaths were definitely not something to be taken lightly. However, Venerable Ambrose needed someone to look after him. He still didn't know they were fighting Tyranids for Emperor's sake. Makradon needed to make sure they didn't lose this relic. "I will accompany Venerable Ambrose...and see that he is well-looked after. It would be rather hard to lose him." Makradon sets off after Ambrose, ready to assist him in any way possible. "As you say, squad leader, I know my oaths and will follow you." Bleda didn't want to escalate any conflict when in the field. If it came to what he thought he would have words with the Dark Angel afterwards. BATTLE-BROTHERS, WHAT HAS HAPPENED, YOU SEEM TO HAVE SHRUNK! OR HAVE I GOTTEN BIGGER? THAT LAND RAIDER SEEMS AWFULLY SMALL! HAVE I INCREASED IN SIZE BATTLE-BROTHERS?! Khol and his few squads of guardsmen hurry through the ruins, not making good time due to the treacherous nature of the ground. Overhead they hear the distinct sound of astartes jump packs as Albrect and Lucius easily overtake them. For Lucius and Albrect, the city was like a ghost town. Clearly the PDF put up a fight as they desperately sought to give the population a chance to escape. Most of the buildings were half skeletal frames and many sections were complete rubble. The sounds of battle echoed far and near, as you left the cliff faces and proceeded towards the soft 5th location. Within the hour, you make it, finding a perch atop a dilapidated administratum building. The situation wasnt good, not good at all. The brentonians had failed to take the coast, and wer inned down to a small beachhead, barely 20 meters across. A large force of tyranids bore down on them as they used wrecked chimera's and bodies as makeshift cover. What cover wasn't obliterated by packs of warriors armed with venom cannons was bypassed completely by bio-vore artillery pieces. Three barges loaded with 2 basilisks each sat useless in the black water, merely 20% of what had been allocated to this landing. "Im going in, praise be" Albrect says before leaping towards the nearest warrior pack, leaving Lucius atop the structure. There were no options availble, nothing else could be seen but a desperate gamble. "Listen up." he voxes the barges. "Unless we do something reckless, theres no chance of victory. I need you to bring your weapons to bear on the forces pinning your men down." After a second, he got a response, "We cant do that. The recoil will tear the floats apart and they'll drown." "A small victory is still a victory. No choice." He awaited a response. After a second, he got a reply. "Understood, we'll do it." They began to set up the munitions, Lucius saw where he could next best be utilized, he jumps for the small strip of land the brentonians clung to. Albrect landed in the midst of the pack and began tearing into them with the power axe. Limbs were severed and scything talons were parried but the warriors had stopped advancing on the beachhead-Holy Mission complete, praise be. Lucius galvanized the men on the beach while the basilisks set to work. Large craters opened up where guants and biovore's had been before. Soon, the vox burst open with new cries for help. He turns to the barges, seeing one of them begin to sink. It was a small price to pay in the long run, Two more basilisks were lost to the inky black, but many of the men were rescued by Chimera's that had swooped in for survivors. At least some of them were saved. New holes in the formations began to open up. Looking to the east, Lucius knew somewhere that Khol and his bunch had arrived. Khol had the veteran squads set up atop a small building, well out of view from the battle going on. With them in place, he had moved in closer through the ruins. He found a perch not too far away from where Albrect and Lucius had landed in the first place. He stays hidden, and out of sight, and calls firing solutions to the light mortar squads. Bleda, Hydrako, and Cassiel move in with the forces landing at the port. They soon find themselves in heavily shelled buildings and piles of debris, the sounds of battle cast from ahead of them. Cassiel issues the instructions, trying to take the cleanest streets with the least amount of barricades and dragon's teeth tank traps. A column of tanks heads up the rough street. The buildings on the sides turned the street into a valley of sorts. Bleda saw they trap just before it was sprung. As soon as he says it fire rained upon the column. Most of it was ineffectual, harmlessly scraping paint from the heavy battle tanks. "Return fire!" Cassiel orders, and they obeyed. Cassiel had underestimated the destructive power of the battle cannons, not used to the combat of metal beasts. He preferred heavy weapons, yes. But his specialty was destroying tanks, not using them. The buildings crashed and crumbled all around, unable to take any more damage than they had. Miraculously, neither he nor Bleda was injured, and the surprise attack was quashed. What this did, instead, was cause a blockage from the column that profoundly set them back. The relief force ground to a halt four km from the first site. "Back the vehicles up and find a way around." he orders the redeployment. Now he was wiser, they needed to spread out to avoid more ambushes like that one. If those tyranids had more AT capability.....he thinks. The damage could have been worse. A few tanks were total loses and some were buried and would be out of commission for the time being. Bleda crawls from the rubble as Cassiel was redeploying. It would keep them from arriving to the main landing en masse, hampering the aid. "Hydrako, take those chimera's and crawl over this mess. The chimera shape should allow it to traverse these collapsed buildings easier than a leman russ can." He was right. The chimera's lower center of gravity and longer hull meant they could climbs the mountains of rubble like a boat could traverse a monster wave. Hydrako had wisely held back with them, in order to boost his considerable mobility even further. The streets ahead were full of tyranid ambushes. They climbed the piles and kept moving on, spreading out to avoid another large scale assault. Hydrako's chimera moved a pace, then something exploded and the chimera stopped. The driver was dead, they would have to foot slog it now. He and they exit the chimera and he orders them into an effective assault formation. Just as they did, they were under attack. Lightning fast genestealers weaved in and out of the broken windows and walls, drawing fire before attacking from opposite sides. Hydako cuts them down with his chainaxe and his storm bolter. But he finds that his school of little fish had been gobbled up by Dagon by the time he had finished. He moves away from the scene of death, in order to assist another squad. Again and again, Hydrako linked up with a squad, just to have a sudden ambush wipe out his new school of fish to the last man-him. Something bothered him about the situation, it shouldn't of, but it did. The men he led to their deaths were nothing to him, but their deaths ate at his consciousness. For days, even weeks, he would see relieve scenes of grisly death in his geneseed induced half dreams. Why did this rankle him so? The whole front had devolved from a coordinated push into deadly games of cat and mouse throughout this section of the city. 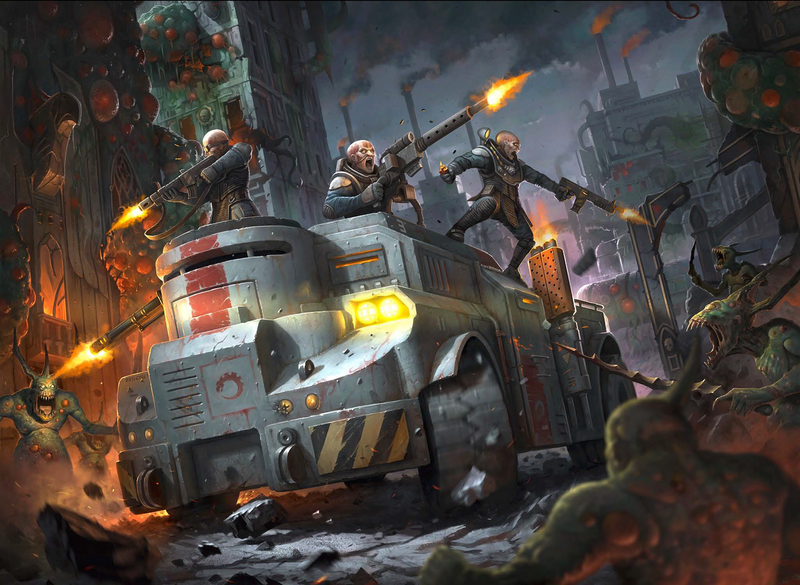 Human-tyranid genestealer hybrids led the ambushes alongside the genestealer beings they idolized. This happened to the forces arriving from the sea AND those coming in from the port. Even the ministorum forces suffered badly, most notably the frateris militia. What they lacked in endurance they made up for in sheer tenacity. The Exorcist tanks were zealously guarded by battle sister squads as the organ-miester played the keyboard. Missiles shot up from organ tubes alongside great battle hymns that invigrated even the dying. Their progress was excruciatingly slow, but it held up reasonably well as they set fire to any shadows that sat in their path. Only the penitent engines rushed forwards to clash with re purposed promethium mining tanks. Mutant humans chunked heavy explosive charges from the backs of the vehicles even as they were crushed by the penitent engines. Serephan wondered what he should do. The rest of draco left and he was all that was left. He would show them....he would prove his worth to the kill team once again. He boosts his jump pack, headed in the opposite direction, East towards the main landing. He was alone, like a solitary bird of prey among the treetops. Like those predators, he had the benefit of a bird's eye view. He soon finds himself upon the edges of the main battle. The front must've extended for at least 7 straight KM. In the distance he saw a lumbering bio-titan, taller than most of the surviving buildings. The major would have to take that thing down on his own with his own weapons. Serephan wanted something to kill- no an enemy to kill. The blood thirst was setting upon him again. He could feel it. The first victims of his wrath were large mutant-human hybrids with ugly faces and powered mining tools. He landed in the center of them as they sought to flank the landing site. Without any preamble he begins slicing them, fully under the thirst. The heretics were tough, he couldn't make out the insignia's on the pauldrons, but they must've been mortarions. He slices them messily with the chainsword. Blood and foul ichor spray everywhere. The chainsword cut through the armor easily enough, but even with such grievous wounds they fought back, using powered hammers they had acquired somewhere to replace bolters and power swords. "Traitors!" he yells ncoherently as he hacks them to pieces, one by one. He came to his senses in a field of bodies, not entirely human, but not entirely xenos. 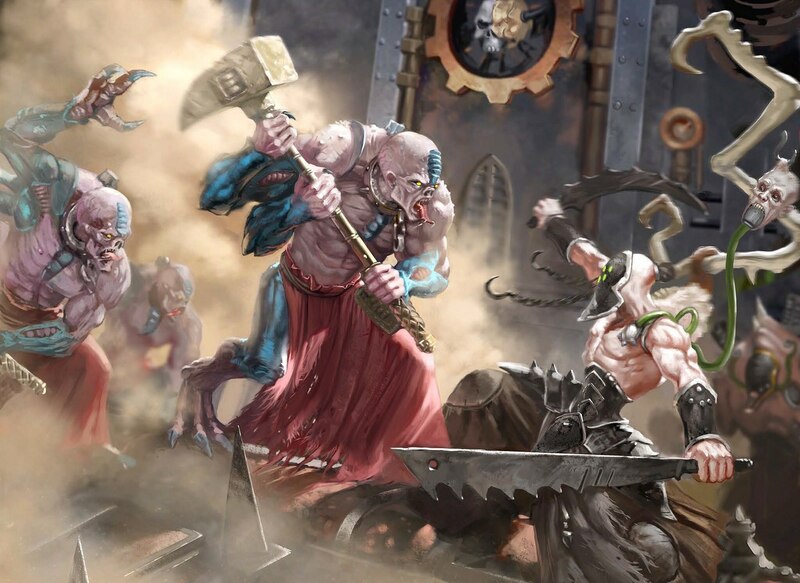 They could only have been genestealer abominations, setting in from what remained of the local populace. The large bio-titan he had spotted earlier sat still in the distance, having sometime been felled by the Major's forces. With a sharp grin, he again moves towards the main battle, eager to show them his worth. Makradon and Ambrose had set out with the ministorum forces headed for ironbound, wherever he was. No one spoke to or even acknowledged them. Just outside the city, they split up to cover a wider area. The mounted dominion squads easilly outpaced the lumbering Ambrose and the slightly faster Makradon. "SMALL FELLOWS! DONT LEAVE ME BEHIND! WE SHALL KILL GREENSKINS TOGETHER! I WILL NOT HOG THE GLORY THE TIME! THERE IS ENOUGH FOR ALL!" Makradon followed silently, making calculations based on the differing directions the immolator mounted squads went. They had a 67% chance of finding Ironbound before draco at this rate. He looked up to find thim in the middle of a hard-pan desert. The alien wastes stretched out before them as far as the eye could see. It was desolate and isolated to say the least. His optics on his HUD blinked on a fleck in the distance. His armor's spirit had locked onto something. He instructed the machine spirit to magnify and enhance. The small square grew larger and line of coding swept downwards, attempting to digitally remaster the image. In the end, all that remained was a pixilated mush. "Brother Ambrose, direct your auspexes North by northeast 14.67 degrees, Tell me what you see." Ambrise swiveled in the direction indicated and finally grew silent again as his auspex took its readings. "There is a structure in the distance....ORKS! It can only be ORKS! Haha! TO BATTLE BROTHER!" Makradon sighed inwardly. Venerable Amrose was even less acclimated than he had been when he had freed him from the bonds of sarcophigal slumber. He would need to look again at the stability of the spirits of the ancient armor, and make sure Ambrose had not been corrupted by faulty data. Such tasks could only be done in a well-equipped forge. In any case, they had a spot that could be a possible location for Ironbound. The likelihood the ministorum was already there was substantially high; but if those paths converged, maybe he could slow them down until the rest of the kill team arrived. COME OUT, COME OUT WHEREVER YOU ARE, LITTLE ORKS! Ambrose started running toward the ruins with his tiny dreadnought legs. Lucius stood among the Bretonnians at Site 5. Bodies lay strewn about, human and xenos alike. But the xenos counted far more and he took small pride in that. The decision to sink the basilisks to save the front had not been an easy one, but in the end it had been necessary. The front was secure. More basilisks could now be brought in. Already flamer squads were clearing swathes of dead tyranids away in order to set up a working perimeter. He voxed through to Guard command. "LZ 5 secure. Losses are substantial. Basilisks lost. Reinforcement may begin immediately." After giving a few words of encouragement and praise to the NCOs and officers on the ground, emphasizing the importance of getting anymore heavy artillery that lands back atop the cliffs when the time comes, he switches back to Draco's private channel. "Sites 5 and 4 are secure and in Imperial hands. Moving back to link up with the rest of Draco now. Cliff team on me." He burned his jump pack, meeting his brothers at a predesignated rendezvous point. He clasps forearms with them, quickly asking the obvious question. "Where is Seraphan?" After they had done everything they could do to support the landing zones, it still wasn't enough. A handful of Marines multiplied the effectiveness of the guard units, but Draco couldn't be everywhere at once. Cassiel had risked much to assist with the assault, he couldn't let Draco be wasted on garrisoning the site. "It is time to join Ambrose and Makradon. 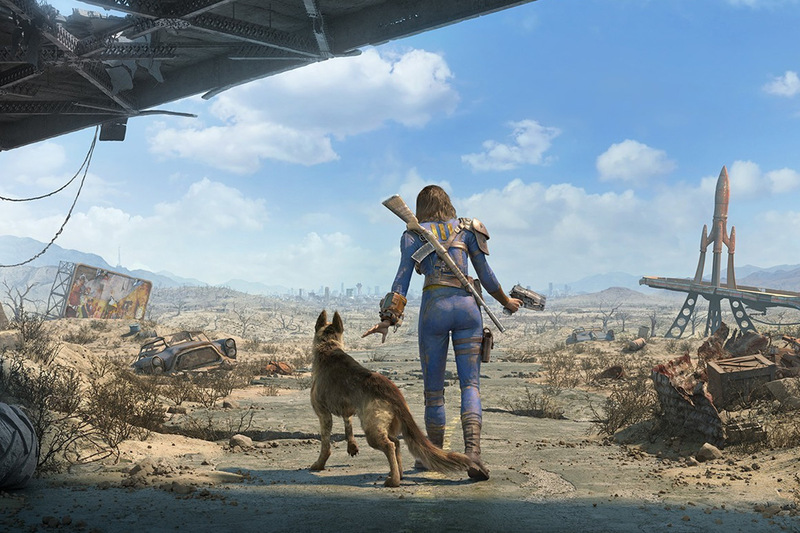 Someone find me a working chimera and we will ride into the wastes". Serephan's voice crackles over the vox. "Im with the Major's group." Lucius withheld a sigh. Not only had Seraphan been nigh uncontrollable once again, now he had more or less deserted the team to pursue his own agenda. "Roger. Link up with Cassiel ASAP." They had wasted time in his view in this 'diversion', but Albrecht genuinely wished Cassiel's risk wouldn't matter. He had no wish to see the guard fail on this holy endeavour against the Tyranids. He'd like nothing more than to worship Him on the battlefield all day long, but even he had to make sacrifices in pursuit of the bigger picture. Makradon follows behind the wake of Ambrose, smiling underneath his helm at the sheer absurdity coming from the Venerable one. He surely would need to look into maintenance on the most holy relic. They'd be at the building faster than they knew and hopefully they could get to their target. Time had been wasted... to some degree, but there was no use dwelling in the past. They'd need to get there as quickly as possible. Makradon speeds up slightly, knowing that time was of the essence. Hearing that his battle-brothers are seeking to join them, he starts sending various indicators to help the rest of the team find them. Ambrose and Makradon make it to the facility within minutes. 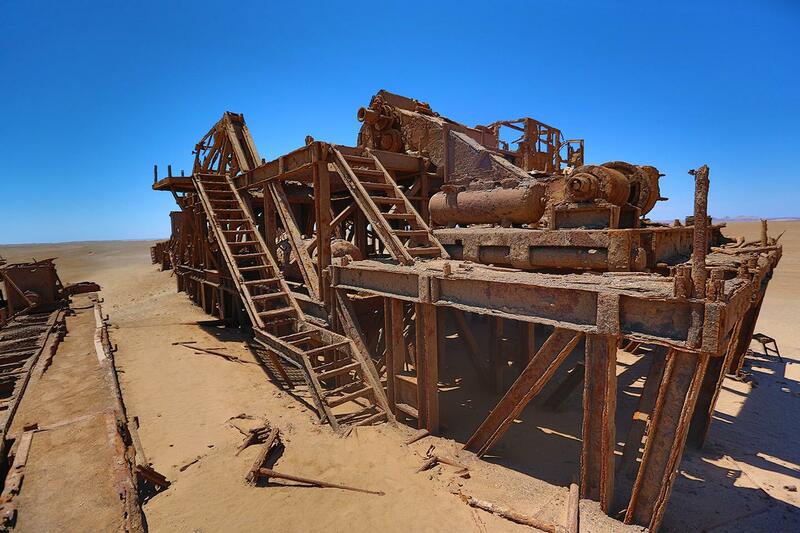 It was an abandoned mining rig, left either at the coming of dagon or before, to rot in the wastes of Castobel. There was no visible damage and no signs of people. Sorrounding the rig was a total of about 20 sheet metal buildings and 2 buildings made from re purposed storage containers. The silence was ominous as the only thing that could be heard was the wind as it whistled through the metal structures. Bleda curses the lightening speed of the Genestealers. They were tearing the Guardsmen apart while the Astartes were to few to be everywhere. But he soldiered on and followed where Cassiel went. With the landing zones secured, the guard were in a decent position to push forward and retake the entire auxiliary city. As much as he wanted to help them out through the whole affair, Ironbound awaited. He requisitions a chimera from the guard, it was in good shape and appeared to be at least 50 years old-a good vintage he mused. It would have been preferable to jump pack straight to Cassiel's position and move out from there, but Khol's scout jump pack would not last much longer. And they would probably need faster transport for Hydrako in any case. It takes almost an hour to make it to Cassiel's position. The guardsmen had set up a base camp on the beach head and were taking tallies of dead as the chirurgeons added more. Dead's were so far at the 20,000 mark, and still rising. Cassiel, Hydrako and Bleda awaited them as they did drove off the black water onto the glass-sand of the coastline. Soon after, Serephan joined in. With that, Bleda takes the wheel and drives east into the wastes towards Makradon and Ambrose in search of Ironbound. They made it about halfway to the position (1.5 hrs in) when they come across a smoking wreck of a immolator transport. Searching for any sign of those dastardly orks, he starts looking around the camp. He yells as he lifts up the sheetmetal buildings to see under them, as if they where cups hiding a coin. When he came across a metal container, he crudely grabbed it, fliping it upside-down like a trashcan on the ground. MIGHT THERE BE ANY CLUES IN HERE? Lucius burned down at the closest high ground to the Immolator. He immediately begins scanning for contacts. "So, Cassiel, should I stay with transport in case we need to leave in a hurry or get out to look over the scene?" "Which do you think is a better use of your talents?" "Driving and finding the way to where we're going is the best thing that I can contribute with right now. So I'd opt to stay in the vehicle and keep it ready." Bleda looks at Cassiel and the wreck and the investigation taking place. Albrecht trudges around the destroyed vehicle as Lucius he noted how the Immolator along with it inhabitants had been destroyed. An initial explosion underneath... mines? He said a quick prayer for the dead sisters before opening squad vox "Brothers, the tank was destroyed from an explosion from below, perhaps a mine?" "We don't have time for a delay. Shall we follow in the tracks of a vehicle that avoided destruction, or do we have a way to detect and avoid them at speed?" Lucius responded to Albrecht. "Perhaps. Whatever it was, it was powerful enough to rupture the up-armored hull and ignite the promethium stores inside. Stay quick and mobile." Lucius thought on what Cassiel said. Tyranid mines were organic and typical acid based. This felt different, but he wouldn't know for sure until he found an intact device.